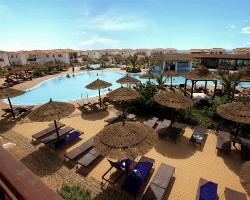 *Melia Tortuga Beach Resort* is on the sun-drenched Atlantic island of Sal in Cape Verde. An idyllic location, impeccable service, and excellent facilities make it the ideal choice for couples and families looking for an unforgettable vacation experience. Discover a great selection of bars and restaurants, two large pools, children's club, fully equipped gymnasium, spa, and a beach bar, where you can enjoy drinks as you watch a glorious Cape Verde sunset. To discover more, please visit www.tortugabeachresort.com. Enjoy carnival season and the ability to use several weeks a year! Rare resale opportunity! Buyer may receive a title fee credit, inquire for details!